In Israel Rabbi Wolpe at a rally stated that if the government was properly run, Olmert and his gang would be hung for aiding the terrorists. The tabloid press immediately seized on this accusing Rabbi Wolpe of calling for vigilante justice and setting up the usual cry of "Right Wing Extremist" and "Yigal Amir". But what Rabbi Wolpe had called for was something much more 'disturbing' than mob violence, he had called for the country to be run according to its principles and its interests, rather than the corrupt whims of its politicians. For the last decade and a half, the political and media elite of Israel have been propounding that peace is better than war and warning Jews outside Israel to respect Israel's democracy. Today Israel has neither peace nor democracy, it has an illegitimate political class bargaining away the nation's dearest treasures to terrorists. The peace process has been an auction in which Israel has been constantly raising its bids while the Palestinian Arabs have been taking more and more items off the table. No one in Israel seriously believes there will be peace anymore but the negotiations and the settlement talks continue. Where Israel started out by offering an autonomous area inside Israel in exchange for middle eastern peace, today Israel is offering a country complete with Jerusalem itself up on the altar in exchange for the faint possibility of an end to the constant violence. Israel has no democracy anymore. It is ruled by a man supported by less than ten percent of the country and by a party illegitimately put into power by a dead man. This same government ruthlessly suppresses dissent and bribes its coalition partners. Non-violent protesters are kept detained for months. Ruthless brutality is practiced along with ethnic cleansing of Jews by the will of this government. Without democracy, the Olmert government has no right to exist. Without peace, every single politician that has made peace his policy has failed and must acknowledge that and resign. Without peace and democracy, this government has no right to exist. The political class insists that their whims should override the principles and the interests of the state. They are wrong. Not only have they betrayed the principles on which the State of Israel was founded, they have betrayed the interests of the state and finally they have abandoned democracy and the rule of law. Their occupation of the government is a crime against the state and the nation. That is why Rabbi Wolpe is correct and his critics at the OU, which made nothing more than a feeble whimper in response to Amona and Gush Katif, are wrong. A state must punish treason. If Ehud the man gives a terrorist a gun, he is a criminal and a traitor. If Ehud the Prime Minister gives the terrorists 10,000 guns, can there be any doubt that he is a criminal and a traitor? If anything as Prime Minister he is more subject to being held to account than as a private citizen. A citizen's treason is only a treason against his citizenship. A Prime Minister's treason is a treason against his duty in public office. The same government which has no problem locking up 14 year old girls indefinitely for standing silently at an intersection has a problem with being held to account for its own crimes-- but most tyrannies do. Political corruption and military failure mark this government for removal. Treason and usurpation of public office mark it for trial. Those who have a problem with Rabbi Wolpe's statements should ask themselves, what is the greater outrage to arm the enemy or to call for the trial and execution of those who arm the enemy. Those who find his statements impolitic, should ask themselves how far moderation has gotten them. For a decade and a half five corrupt Prime Ministers have labeled anyone who opposed them as extremists. But it is their policies that are an extremist betrayal of the founding and defense of the state. Their extremism has cost thousands of lives on both sides and betrayed the sanctity and security of its borders and citizens. They have piled treason on treason and deception on deception. Their crimes call for justice, not random violence but the organized mechanism of a restored state punishing those who betrayed it. The best way to confront extremism is not with moderation but with opposing extremism. Not in random rhetoric or unfocused violence but in drawing the rhetorical and political lines further and further, rather than pulling them back. Moderating your positions is a form of surrender. The way to deal with extremism is to confront it by pushing it to the limit. If politicians choose treason, then you must not only condemn it as treason but speak of punishing it as treason. Ideological victory can never occur based on half-hearted positions, but only occur in the full clash of ideologies. Why does treason prosper? Because when treason is successful none dare call it treason. A person who, with intent that any area be withdrawn from the sovereignty of the State or placed under the sovereignty of a foreign state, commits an act calculated to bring this about, is liable to life imprisonment or the death penalty. Yep. And the rabbi said if the GOVERNMENT were run properly people who conspire with terrorists would be put to death. That's a far cry from saying if the Israeli people knew what was best for them they'd go out an kill every dirty politician. There's a huge difference between calling for mob violence and vigilante justice and wishing the nation gave traitors and terrorist conspirators the death penalty. Did I write something wrong, Lemon? As far as I'm concerned everything Peace Now is doing is inciting violence and they should be thrown out of the country. Anyway, I just think the rabbi was frustrated and calling for a legitimate investigation and trial with evidence and witnesses against the corrupt politicians--and the death penalty for anyone found guilty of treason. Okay. TY :) Just checking. It is hypocritcal for Olmert to be conspire with known terrorists to give away land and in the process murder Jews while at the same time putting little teenage girls in just for protesting and refusing to give their names when they're arrested. Boggles my mind that they're not just given a bench warrant and sent home to their parents. I just wonder--IF someone were to assasinate Olmert but leave his party intact would that do any good? Wouldn't he just become another idolized martyr like Rabin? And suppose a group of Israelis decided to storm the Knesset and capture or kill everyone in Kadima or Arab MK. In other words a South American or Arab type coup. Would that really do any good, if it totally collapsed the entire infrastructer? One of the the most terrifying things about 9/11 aside from the loss of lives was the attack on the Pentagon. Had the terrorist hit Congress and the White House we would have had no government. It would have been complete anarchy. I don't know what Israel's solution is. Sultan, I have supported Rabbi Wolpe's statement as I understood it, on J. Post, YNet and other Talkbacks. On another note, you appeared to express incredulity when I wrote, it was well known in political circles that Mr. Bush wanted Olmert to replace Ariel Sharon. Bush therefore snubbed Benjamin Netanyahu, whom Bush considered a hardliner. Netanyahu is no way a hardliner. You requested sources from me. I have no sources other than my memory. Why did Bush initially want to avoid meeting Netanyahu during his visit? What is George W. Bush's problem with meeting this moderate, whom much of the right considers a compromiser; a waffler? Doesn't this demonstrate Bush's own anti-Israel extremism? ....Bush initially did not intend to meet with Netanyahu during his visit, but US Ambassador to Israel Richard Jones called the latter personally early Wednesday and invited him to meet with the US president. Great article, but strangely you left out the name of the visitor to Israel,the Slavemaster who is just giving his loyal puppets their latest marching orders. The only reason Olmert is still in power is that he makes a very good puppet. The other puppet Netanyahu is waiting in the wings if called to replace Puppet A. When will Israel deal with this problem of Whores for leaders ? I get a kick out of you going after Ron Palu but completely silent on Israel's destroyer ,you pal George . Olmert is "a strong political leader," said Bush at a dinner party with cabinet ministers, as well as Olmert and his wife Aliza. The US President called on Olmert's deputies and coalition leaders to safeguard Olmert so that he could continue to lead. Sultan, I agree with Marcel. I will not stop bashing and condemning George W. Bush. I believe he is an enemy of the God of Israel. How dare him keep stating the occupation must end. What a phony Christian! Any American Christian that believes this man is a genuine Christian is deluded. Not only that, I believe any American that supports Bush's policies with respect to Israel is complicit in his evil deeds, as much as Germans that idolized Mr. Hitler were complicit in his crimes. I am not comparing the two other than both are guilty of crimes against the Jews. In Bush's case, Israel and the land of Israel. Beyond that, as a thirty six year registered Republican, I hold the entire GOP guilty of Bush's crimes against the Holy Land and the Jews. Bush has innocent Jewish blood on his hands, as does my party. Not one major Republican leader has condemned this evil leader. Not one. Not one Republican candidate has disassociated himself from the Bush /Saudi road map for Israel's destruction. sultan you really believe I would fall for your lame excuse to remain silent. You are perverse in a Kapo kind of way. Hitler wasn't up for re election either. Sultan is a devious kapo dressed in Jewish religious garb ,always protecting his Herr Bush. His silence when it comes to Bush especially after his visit to Israel and his words against Israel prove this. His attacks on Ron Paul (right or wrong) while remaining silent as his Bush burns and torches Israel says alot about this Kapo and how he misleads his followers. How Israel deals with the rocket attacks I would hope is done in a way that not only protects herself, but worries about innocent life. And I'm convinced the Prime Minister does. He understands he has an obligation to protect Israel. He also understands that he's got to be circumspect and reasonable about how he does it, so that innocent people don't suffer." 400 tons of bombs were dropped on a neighborhood south of Baghdad yesterday by the U.S. Air Force and as usual the number of dead civilians has been quietly covered up. The hypocrite Bush has a big double standard when it comes to restraining Israel, something he does not show to Islamic fighters elsewhere. Is there anyone in Israel with the backbone to tell him to get lost ? The hypocrite and phony peace maker OK'ed his US Air Force to drop 400 tons on bombs in a neighborhood south of Baghdad to exterminate a few Islamic terrorists . Israel should follow his actions and not his words by carpet bombing the Gaza Hamas enclave . Collateral damage and the deaths of family of these terrorists is to be expected as the U.S. knows well as they do not practice what they preach to Israel. It's time to stop letting the phony friend Bush restrain you and do what he does not want you to do, DEFEAT THE PALESTINIAN'S ! On a related matter. 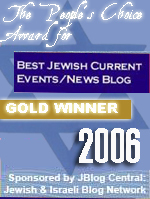 I've been a contributor to Arutz Sheva for a few years. Maybe I will be a contribor no more. We'll see. I gave to this recent "Building Israel Project." It was a protest of the Bush visit by the right in Israel. They began with a building project in Har Homa. 6. Dead, Dead, Dead, but you still pray to your idol Ovadia Yosef. What a pussycat you are. You don't mind walking up to a gay pride marcher and saying that "it's an abomination," but somehow when it comes to dividing the land, losing a unified Jerusalem and the Temple Mount, you join the other settler wimps and blag to the choir about gog Bush. Why aren't you all marching in $has Land with posters of O. Yosef in a kefiya? Hm? 19. sk #6: You make a good point! You wrote: "Why aren't you all marching in $has Land with posters of O. Yosef in a kefiya? Hm?" Yours is a good question. Why aren't we marching in front of Rabbi Yosef's home with kefiyas? Rabbi Yosef is betraying the Jews, isn't he? How can a rabbi justify remaining in this evil government? How can a rabbi support Oslo? Didn't Rabbi Yosef support the murderous Oslo accords with mass-murderer Yasir Arafat. Didn't Rabbi Yosef command Shas to vote for Shimon Peres as president of Israel even though Peres has much innocent Jewish blood on his hands? Why aren't Jews in Israel protesting this rabbi who is with our enemies? Doesn't sk have a point Sultan? Are Jews afraid of a great rabbi even when he is doing evil? Are Jews and Christians afraid of Bush even when he is doing evil? I read (Christians United For Israel) Pastor John Hagee's letter to President Bush about Israel and dividing Israel last July. It was ostensibly a warning-letter. Instead it was a groveling, love letter. Is everyone afraid of Bush? attacking Shas though is difficult without alienating a large amount of Mizrahi." I understand the problem. You obviously raise an important point. Something that occurred to me but I haven't worked it out. I mean, it occurred to me that some of Yosef's followers might be offended if Yosef is protested by the right. You put it in better perspective; the sheer magnitude of anger that a protest would or might generate. Let me ask you a question then which might touch on your own personal faith. I'm sure you've seen the Hebrew word "tamam" --- I am uncertain how it is written. It means complete, whole, integrity, ect. A few of the men in our Tanakh were described in this way. Men who walked in their integrity. It seems to me if a Jew tithes and prays three times a day, but curses his mother and father; if refuse to help the widow and the orphan, no matter how meticulous a man or woman is in his or her religiosity, he or she is not complete or whole. Am I wrong? If a Jew in Yesha claims to be a G-d-fearing Jew in all his or her ways, yet withholds from the Almighty what is due, is he or she complete? Do you think the Almighty weighs things in political terms like mortals weigh things. Is HaShem worried about alienating a large amount of Mizrahi? If, as you and I believe, R. Yosef is doing evil in the sight of the Almighty, would the Almighty command the Jews not to offend Mizrahi, lest we anger them or lose their support? I firmly believe in peaceful protest. I have participated in several. I believe it is imperative despite the result, positive or negative. I have personally seen the positive result of protest; physical protest, protest in the newspaper on the radio, etc. It is critical in this our day. Shall we accept these semi-cult worshippers and their cult leader and therefore remain silent lest we offend them? I do not believe the Christian Right is the solution, on this we agree. It's just that I hold Christians to a very high standard. Why shouldn't I? Bush talks about his favorite (Jewish) philosopher. I am a Jew but I've read the gospels. By any standard of measure Bush's personal savior was a Jewish chauvinist. Today we call these Zionists. Is Bush pleasing his favorite philosopher? I think not. In the world to come, I believe his favorite philosopher will tell Bush to "get lost." If a Christian tells me that God (or G-d) will punish America should we turn on Israel then I want to see them put their faith into action at the voting both and elsewhere. I am also pro-life and pro-traditional family. Only the prophets made Israel the test in the last days, not these other social issues which are indeed important. I would tell my Christian friends if you want to keep a healthy America spiritually and morally, don't support politicians like Bush who are trashing the Holy Land. I do not believe the Christian right is the solution but don't (as a Christian) tell me you are praying for the peace of Jerusalem and that you support the land of Israel 100% and it all turns out to be lip service. This is what I believe I am seeing in many of our Christian friends today; lip service. Which is exactly what I have been saying and writing all along. No, these so-called Christian Zionists are not about to turn their back on their born again president, and certainly not for Israel. Their only interest in Zionism is to make Zion a Christian nation. 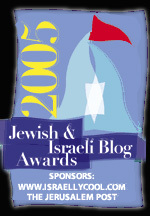 Hagee might hold all of those 'Night to Honor Israel' affairs, he can shout "Israel Lives" at the top of his lungs to Jewish audiences but his sights are on pushing Bush to start a war with Iran or any other Arab nation because in his mind and the warped and ultimately anti-Semitic minds of the Christian right it will usher in WW III and the Final Conflict in which Jews will either accept their man-god or be condemned to hell. Well, I don't believe in hell, but the power and influence Christians United for Israel has with Washington could lead Israel into a war. All of this is extremely malicious. Bush is pushing for a Palestinian state? Again, the end result will another Holocaust. Not of the magnitude of the first but a Holocaust nonetheless. Read Hagee's book, or better yet watch his daily TV show on Christian TV. I have and have read between the lines of his "love for the Jewish people." You believe peaceful protests of the kind we've seen in Israel are useless, which is why the Bush rallies fizzled. You could be right. Yet you admit that a peaceful protest of Rabbi Yosef might be politically explosive. It might alienate a large segment on the right amongst the Sephardim. Were religious Zionists to protest Yosef's home with signs and posters saying Yosef is with Israel's enemies, Yosef supports Olmert, etc., this could be as you say "tricky," nor will it win over Shas voters. In other words, you would concede that a peaceful protest of Yosef would NOT be useless in terms of having no effect. It would anger many. And so what if it does anger Shas voters? Maybe they need to be angered as they continue voting these evil men into office. I listen to R. Tovia Singer and Tamar Yonah (Israel National Radio) debate a similar point. Tamar believes we need to win over the Haredi to the religious Zionist; to the Nationalist fold; we need to ally together. It sounds good. Singer says it's useless and futile because Haredi, by and large, are looking at other issues like funding for yeshivas, social programs, etc. and are not as concerned about the land of Israel. In other words, they are voting their self-interests. What you appear to be saying is, we cannot afford to antagonize these Jews that are only voting their selfish interests. So, are you willing to allow a huge slaughter -- which will in all likelihood come upon the land should Bush and Olmert succeed -- rather than risk antagonizing Shas voters who are committed to supporting Shas regardles? I do not follow your line of thinking. Your thinking reminds me of another prominet Jewish conservative web-master -- he operates a largely read conservative web site -- that pretty much uncritically supports Bush. When I protested via e-mail, he told me it is 'easy to do what is morally correct but politcs is hard'. What does "morally CORRECT" mean? If he had written "it is easy to do what is morally RIGHT," I would have responded, "you are so wrong!" It is not easy to do what is morally right, otherwise FDR and Churchill would have bombed the railroad tracks leading to, and the crematoria at, Auschwitz. It is easy to do and say what is "politically correct." That is why being politically correct is so popular. Bush is doing and is saying (with respect to Islam and the jihad) what is morally and politically correct, is he not? So what you are saying is, we do not want to offend anyone? It's tricky? Off topic: Holy mackeral, your text is so small! Keli, you've got no argument with me. I gave Hagee the benefit of the doubt. Since then I have come to believe he is phony like Bush; perhaps even a swindler. He has access to the White House. I have reason to believe he does not intend to harm that access. Beyond that, I got the name of his aid from a Christian who was Texas delate to the 2004 national Republican party platform writing committee. I wrote Hagee a letter urging him to admonish and condemn Bush for what he is doing to the land of Israel. Then after I read this sweet, love letter to Bush last July, I again wrote Hagee a letter telling him he essentially gave Bush the green light to move forward in dividing Israel. His aid told he would pass my correspondence to Pastor Hagee’s office. On the other hand, he told me that it has been his experience, my letter would not be given much attention if it had the theme that I believe Pastor Hagee and CUFI Leadership are conceding that is permissible to divide the Almighty's land, which was exactly my theme. And that was the end of that. Bush got the green light from his Christian base and he went forward with Annapolis. You need to understand certain Israeli realities. Ashkenazi Haredi voters will never vote for a Zionist nationalist party. Mizrahi Sefardi voters however were the power both behind the Likud and to a large extent Kahane. Think of them as the Reagan Democrats and think of the problem as being to part say Reagan Democrats from the agenda of the Catholic Church. It's a tricky operation. Simply fighting them in order to "do the right thing" is no answer. I agree with this piece. OU is very disappointing. If you do not have anything righteous or moral to add, maintaining a dignified silence is the best bet. In this case OU did neither. They condemned a righteous and a courageous Jew. Sultan, back in the early eighties, I visited yeshiva, Ohr Somayach, in Jerusalem for a few weeks attending classes. It was a spiritual journey of sorts for me. I was searching out my Jewish identity. Though I am not fully Orthodox in terms of exact observance, I identify with Orthodox -- if that makes any sense -- because Orthodox keep the commandments, Sabbath and other important commandments. When we would eat in the dinner hall, I generally found myself sitting with Sephardi Jews who ate separate from Ashkenazi (mostly American) Jews. It was the Ashkenazi that separated themselves from Sephardi Jews. This one guy asked me, "Why do you eat with us and not with the Ashkenazim?" I don't know, maybe I prefer the spirit of Sephardic Jews. They know the Arab world and the Arab mind because they came from this part of the world, many of them. Sephardi Jews that are old enough to remember, know Israel's enemies. This is why Begin was so popular amongst Asian Jews and rightly so. Nonetheless Sultan, if they are being mislead by their rabbis and by Rabbi Yosef, it is nothing personal and it is not anything against Sephardi Jews at large, whom I have long held in high esteem. They need to be told and warned, their rabbis are misleading them --even a great rabbi like Yosef notwithstanding where he and his family are from. This needs to be the message. Your concern, I believe is misplaced. This is not about alienating Sephardi Jews but letting them know their leaders are leading them away from faith in God; from the God of our fathers. There is no way, Rabbi Yosef is pleasing to Avraham or to Moses (Moshe). His piculiar version of "pikuach nefesh" for conceding precious land; his rationale for committing national suicide is an abomination to the Almighty in my opinion. This is nonsense, Yosef's rationale. I know Rabbi Yosef has since tried to correct any misapprehensions but ultra-leftists like Alan Dershowitz (I listened to his "The Case For Peace" on audio) invoke rabbis like Yosef in order to condemn courageous rabbis like Rabbi Wolpe. This is indefensible coming from a rabbi of this calibre. He needs to be warned by Jewish activists in Yesha, that IF he does not heed these warnings, then he will be publicly protested, even publicly humiliated. It is that important Sultan. We will ultimately not have the luxury or the time to pick the right fight in the right way. We made made this mistake before Gush Katif was leveled by Sharon's bulldozers. We cannot afford any more mistakes like that one. if he couldn't sway most Shas voters, do you think a few kids in orange holding up signs will? Sultan, you wrote: "for the record, protests have been going on against Eli Yishai, Shas' despicable deal cutter, rather than directly at Yosef." This is a great point. Please let me explain the problem I have with this approach. I see much condemnation of Dr. Rice and her overt anti-Semitism coming from the right in Israel and here in America. Secretary Rice is fair game for websites like Frontpagemag and other conservative web sites, but not Bush. Bush gets a pass. No one wants to go directly after Bush. I believe this is a huge mistake. Mr. Bush is Dr. Rice's boss. Consequently, Bush plays the proverbial good cop and Rice plays the bad cop. Rice says the things that Bush thinks and would like to say but cannot afford to say about the Jews -- whom I believe are just as detestable to him as we are to Rice. George W. Bush is a circumspect, even polite Christian anti-Semite. I have met a few in recent years in my local party, the GOP. I was an eight year Republican party activist; until I publicly criticized Bush's policies toward Israel. If I had criticized him on immigration that might have been tolerated, even from a Jew. Like Rabbi Ovadia Yosef, Bush needs to be publicly condemned by the right, not Rice or Yishai. Bush and Yosef must be exposed and condemned. All else is useless hot air. I don't buy it Sultan. Rabbi Mordechai Eliyahu is just as bad as Yosef or perhaps worse. What is with these rabbis? He told religious soldiers to obey immoral orders, to not be insubordinate, to not block roads, to expel Jews from their homes with tears in their eyes. What is with these men Sultan? I saw this former rabbi quoted on Arutz day by day without editorial comment. When I was called for my annual contribution, did I complain? You bet I complained. I've just about had it with our media. David Wilder wrote a piece that was published on Israelinsider but Arutz did not publish it. A neighbor told me Arutz would not publish it because Wilder wrote that America ("not all Americans") is turning against and becoming an enemy (or is an enemy) of Israel. This is true, is it not? Has Rabbi Mordechai Eliyahu had a change of heart? Eliyahu said the Torah's commandment to rebuke errant Jews (Leviticus 19:17) must be carried out gently, and said there are many reasons not to block traffic....."What if someone is rushing home to make sure he can say the afternoon prayers? What if a family is rushing to make sure they can circumcise their baby before the sun sets on the eighth day? How can you justify preventing any of these people from reaching their destinations?" The rabbi also called on Orthodox soldiers not to refuse orders to evacuate settlements, saying they must remove residents "with broken hearts and tears in your eyes," instead of allowing "all sorts of wicked people" to drag settlers out of their homes with glee. "We must not allow a situation of Jews fighting Jews," he repeated. Q. If so, what did [you] mean in [your] ruling not to refuse orders? A. We do not want to dismantle the army that protects the residents and the citizens, and therefore we are against refusal in principle. The soldier must say, "I can't." If they force him to do this forbidden act, he should enter the family's house, sit on the floor, cry with them, and be saved from the prohibition in a passive manner. I guess I am not sure how to find your defense of Rabbi Eliyahu in the Amona section but that's OK.
What I would like to know from you Sultan, how far do we carry this prudence, this sekel or whatever we call it? Netanyahu stayed in Ariel Sharon's cabinet to the last minute before he resigned. He voted for legislation that funded and financed "disengagement." Everyday Shas stays in this government at R. Yosef's command, Olmert is more and more emboldened to move forward with Bush's vision for Israel's annihilation. At what point do we publicly protest and expose this evil rabbi? Sultan, you yourself wrote: "It was Shas which backed the Rabin government and which bears 'Direct Responsibility' for the passage of Oslo and every death by terrorists operating from the Palestinian territories since then. "The blood money that flowed into Shas' institutions and Aryeh Deri's pockets were more than enough to salve their consciences. The only relevant halachic psak din that should be asked of Rabbi Ovadya Yosef is this, 'How many dead Jews are worth the funding of Shas schools?" "How many murdered, religious and secular, Ashkenazim and Sefardim, are worth the shekels Shas has received from the Left Wing politicians they have pledged their allegiance to?" ".....Peres has met with Rabbi Ovadya Yosef, but made no clear commitments yet. As is usual he is likely biding his time and considering offers. The alternatives would be clean honorable men like Rabbi Yisrael Meir Lau and Reuven Rivlin, but Rabbi Lau would have nothing to offer directly to Shas, while a vote for Peres would undoubtedly be handsomely repaid. "Meanwhile Eli Yishai, who has become the new Aryeh Deri, is all too willing to hint at every turn that Shas would support anything from the Disengagement to the release of Palestinian terrorists, if the price is right." Sultan, if the right does not protest Rabbi Ovadia Yosef, I am finished with the right. I gave to the "Building Israel Project" which was a protest against Bush. You believe it was a "fizzle." Fine. I got two calls from Aurtz on my answering machine this past week, little doubt looking for my 2008 contribution. Women in Green sends me letters looking for money. Perhaps you know, Nadia endorsed George W. Bush for re-election in 2004, not without much criticism. I was amongst the critics. If the right in Israel is unwilling -- for pragmatic reasons -- to protest an evil "gadol hadar" (the greatest one of the generation), then I've had it with the right in Israel. I will help them no more, financially nor morally nor spiritually. They deserve their fate. One last thing. "Gadol Hadar." What an insult to the memory of our men of faith. Moshe was described as the meekest man on the face of the earth and yet Yosef believes he is the greatest one of our generation? According to Jonathan Rosenblum, Ehud Olmert, like Barak, is dragging another reluctant president along to destroy Israel. ....At the end of his Post interview, Olmert indicts himself. He quotes the response of President Bush (truly a friend of Israel's) to those who fear that Annapolis will further endanger Israel: "That's not what I hear from the people who represent Israel." Therein lies the problem. Just as Ehud Barak dragged a reluctant President Clinton to Camp David to save his faltering government, so does Olmert push Annapolis because the only thing he ultimately believes in is Ehud Olmert.